We have a preview show up in San Anselmo! This is to promote our upcoming fundraiser show, October 24th, at Pt. 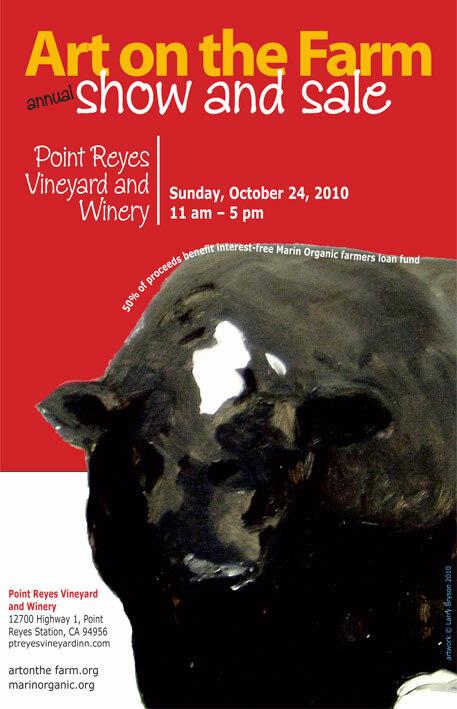 Reyes Winery; a benefit for Marin Organic Interest Free Loan Fund to Farmers. 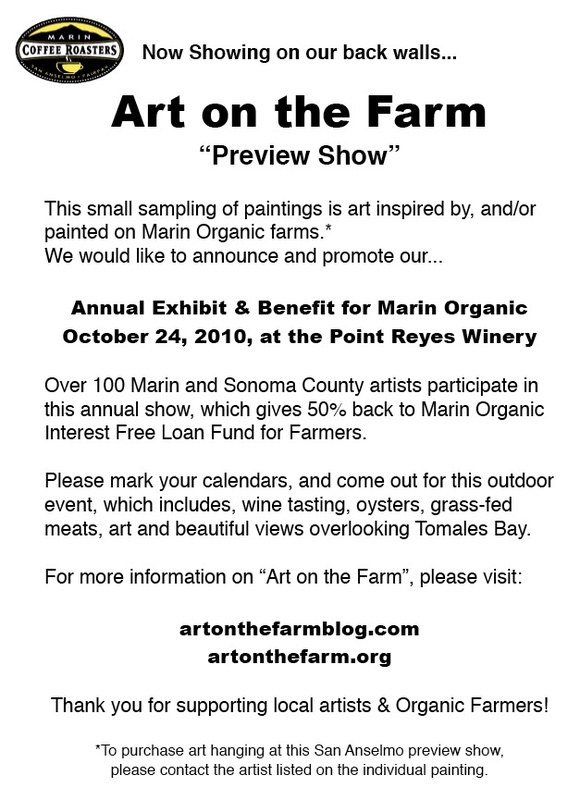 A very small sampling of the 100 or so, Bay Area artists that participate in "Art on the Farm". This show includes a dozen paintings, flanked by our October show posters. Poster art this year is by Laura Williams (blue pond), and Larry Bryson (red bull). Graphic design for posters, by artist/volunteer, Micaela Mardsen. The Marin Coffee Roasters is located at 546 San Anselmo Ave.
***Recent press about this event in Ross Valley Patch, online news: click here to read the article. 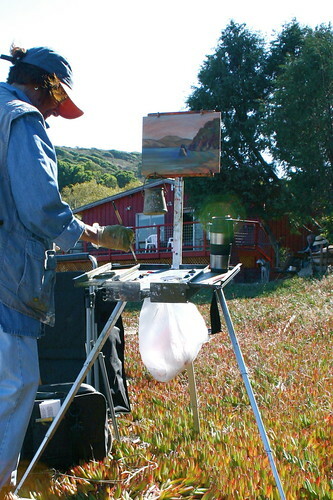 Our group had the pleasure of visiting private shoreline on Tomales Bay for a paint-out this past Sunday. We were invited there by the Doughty family, owners of Pt. 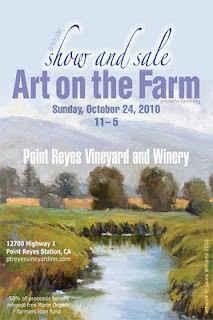 Reyes Winery and Organic Dairy Farm. It was a perfect day, with bright sunshine and low tides at the start of the day. Several of the painters ventured out in the morning, having to cross waters with their easels later in the day. 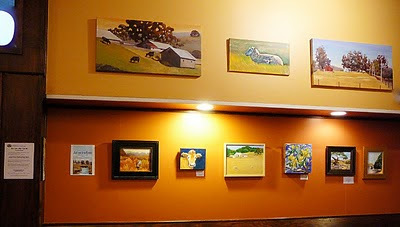 The paint-out was well attended by at least 10 local artists, including Artist Organizer, Larry Bryson, Kate Merriman (painting, above), Chris Adessa, David Miller, Kathy Kingston, Marilyn Greenblat (below), Deborah Cushman, John Deckert, and Colleen Proppé. Click here to view a small photo album of some of the views of the day. For a personal account of the day by one of the artists, who gave an impromptu oil painting lesson to two toddlers, click here. 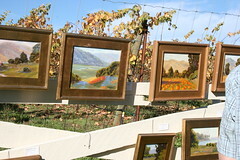 Marilyn Greenblat painting with "Art on the Farm", originally uploaded by cproppe. We are hoping to add more images to this slide show as they come in, but click on the image, below to link to a short slide show of new paintings coming to the October 24th, 2010 group show at Pt. Reyes Vineyards and Winery. For more info, read the previous post as well. Please mark your calendars for our amazing, Annual Group Show at the Pt. Reyes Winery in Pt. Reyes Station, on Route #1, overlooking Tomales Bay. It is a benefit for Marin Organic, in which 50% of the sale price of the art goes to the Marin Organic Farmer's Interest-Free Loan Fund. Poster design is in progress by our volunteer artist, Micaela Marsden, and PR is being dilligently handled by volunteer artist, Kathy Kingston. Help us choose our poster design for this year's show! Which one to you like best? To comment, click the Title of this post to reveal the comment button at the bottom. If you prefer, you may email us your answer, here. 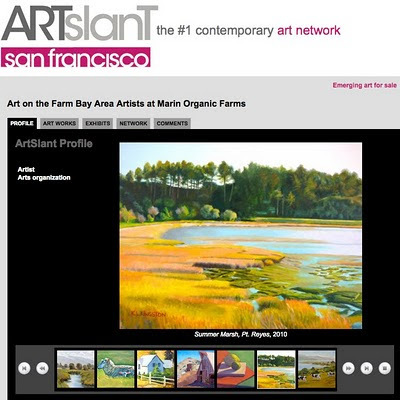 Art on the Farm Weekly.... Catch us on Twitter! 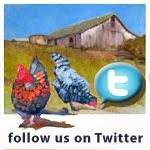 Hope you will follow us for local farm info, Marin artists, and news! Well, it's been a long time since I've had time to post here, but I finally have some amazing photos to share from last year's October group show at the Pt. Reyes Vineyard Inn and Winery. 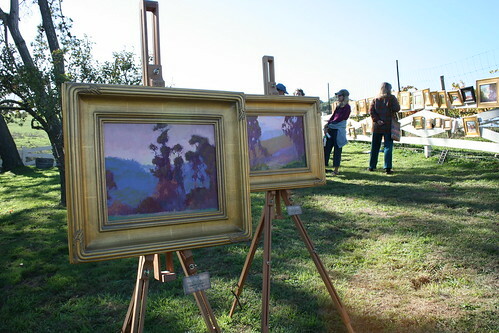 It was a lovely day, and some of the artist's hung paintings outside on the ranch fence. It was gorgeous to look at. My favorite new images were by artist, Kanna Aoki. I thought she did some amazing large canvas work, and really loved photographing her pieces! I hope you will enjoy viewing the set on Flickr; click here to view. To find out where we are painting next, please visit the website schedule. Art on the Farm; Pt. Reyes Vineyard, 2009_ Paintings by Alfredo Tofanelli, originally uploaded by cproppe.